A very good question that I often hear from people who aren't very experienced with Astrology is: How would this reading by you benefit me if everything is/was going to happen for a reason anyway? Or you could find out for yourself with our Life's Purpose Astrology Report. While astrological influences do happen in various ways, we have a flexible range of options for how we can respond to them. We can ignore them, work with them, or resist them, and increasingly, the way we respond to these forces shapes our experience of our life in time. The more conscious you are, the better positioned you are to learn to work with those influences to which you are and will be exposed, rather than feeling like a victim of unseen forces. Some people even talk as though the planet is "doing it to me," like it singles them out. It is really like learning to play the very serious game (of life), where you gradually learn the rules and then with experience, you can obtain maximum benefit from those influences that are in the air (as it were). For example, if you are experiencing a difficult Saturn aspect, it would signal things like "serious influences, restriction, separation, depression, cutting back" but also "focus, defining your identity, being realistic, or concentrating on work." If you try to play under such an aspect your car will break down, you will feel trapped, or feel restricted, whereas if you know such an influences is happening and learn to work with it, you will discover that it is a great time to do your taxes, to redo your website, or to focus on important matters, etc. 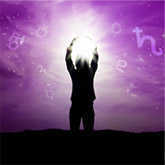 When we learn the meaning of the planets and aspects, we advance our understanding of how to live life to the fullest.